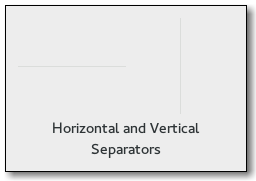 GtkSeparator is a horizontal or vertical separator widget, depending on the value of the orientation property, used to group the widgets within a window. It displays a line with a shadow to make it appear sunken into the interface. GtkSeparator has a single CSS node with name separator. The node gets one of the .horizontal or .vertical style classes. Creates a new Separator with the given orientation.